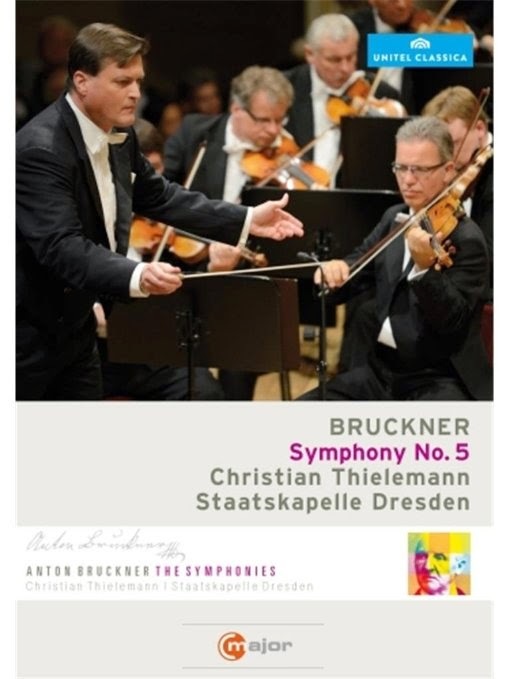 Christian Thielemann’s Bruckner Five is sumptuous on all counts. The video was filmed at the Semperoper in Dresden, a spectacular venue that deserves to be seen as well as heard. And his orchestra, the Staatskapelle, is the last word in German sophistication and textural refinement. Thielemann himself delivers an interpretation that’s wholly suited to the occasion: solemn, grand and imposing. He slips in a few surprises, especially in the finale, but on the whole this is a solidly traditional reading, and none the worse for it. Given his podium manner, Christian Thielemann is an unlikely video star. He’s big and ungainly, and his movements tend to be small and awkward. His baton technique is certainly efficient – you couldn’t imagine him ever breaking into a sweat. It is tempting to describe him as uninvolved, and to attribute some of his more uninspired Wagner performances of recent years to this apparent lack of communication. But in fact, the Dresden players are on his wavelength, and however minimal his actions, he always engages them, partly perhaps because he is conducting Bruckner the way they want to play it. Tempos are on the slow side, though not glacial. More significant is the sense of patience, the shared understanding between conductor and orchestra that the music’s drama and structure will unfold at its own pace. There’s no complacency, but then nor is there much interpretive intervention. Thielemann often relies on the sonic opulence of the orchestra to create the grandeur the music needs, particularly at the climaxes. That is particularly evident in the codas of the first, third and fourth movements. There is no sense of immediate release when the final note ends, as you find in more driven accounts. Instead there is a feeling of finality: the music has reached its inevitable conclusion; there’s nothing left to be said. The finale is the most radical movement. Thielemann makes great play out of its complex thematic structure, giving each of the themes quoted from previous movements a different tempo and mood at the start. When they all become entwined into complex counterpoint, he instead structures the music into long paragraphs, occasionally slowing almost to a halt in the quiet interludes between each dramatic episode. It is not a particularly extreme or idiosyncratic approach, but it seems so after the interpretive reserve of the previous three movements. The orchestra is on fine form. The string sound is glorious, and is beautifully captured. The brass sounds distinctively eastern German, and all the more so for being able to see their eastern German instruments. Occasional slips of ensemble are limited to the moments before climaxes, where tempos are changing fast, and to occasional woodwind entries. In both cases, Thielemann’s reserved baton technique may be the cause. The camerawork is busy but not distracting. Attention is divided about equally between conductor and players. The cameras have been well concealed, both around the auditorium and within the orchestra, and are never visible. The sheer number of close-ups on individual players can seem excessive, especially in a work that is such an ensemble piece. Audio is excellent (in stereo – 5.1 is also available). From the video, most of the microphones seem to be hung high above the orchestra, although there are also some discreet mike stands between the players. The results are clear and involving, although the stings get marginally more attention than the winds. The recording was edited together from two consecutive concerts, and listening on headphones some of the edits are jarring, though they are not obvious on speakers. A solid Bruckner Five, then, imbued with the traditional values of this great orchestra. Christian Thielemann has his advocates and his detractors, and this recording is more likely to entrench their views that to convert. He knows how to marshal the opulence and sonic lustre of this orchestra, which is a great asset. Arguably, though, they could do with some dynamism from the podium to cut through the sheer weight of their sound, but Thielemann’s not the man to provide it.